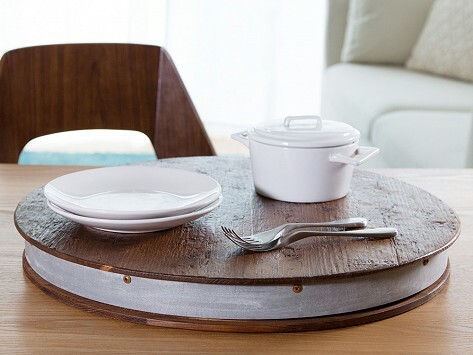 Equal parts tabletop helper and rustic antique accessory, this lazy Susan is a beautiful piece to keep out even when you’re not entertaining. Made in Hungary from salvaged wine barrels and a galvanized metal wheel, the wood is oiled to let all of that original character and history shine through. I was looking for something rustic, useful and fun. This fit the bill. Highly recommend. We love it! Great workmanship! Exceeded our expectations! Very nice, and exactly as advertised. A little pricey for what you get, thus the only reason I didn't give it 5 stars.